Our next Catriona Shearer puzzle. Two of the regular hexagons are identical; the third has area 10. What’s the area of the red triangle? 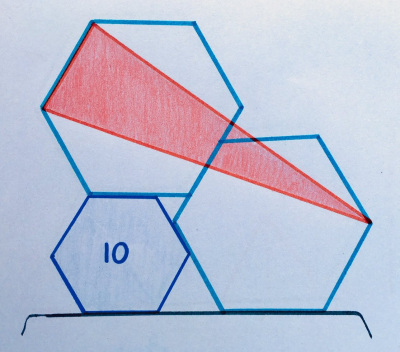 First, what’s the area of the big hexagons? There’s a little equilateral triangle in the middle between the hexagons, and its equilateralness means a big hex side is equal to a little hex side plus a triangle side ( , from the upper big hex), but also a big hex side is two little hex sides minus a triangle side ( , from the lower big hex), and that means and . So the area of a big hex is .